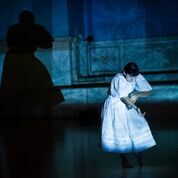 Minneapolis-based choreographer Rosy Simas’ We Wait In The Darkness conjures the many ways in which family stories are transmitted from one generation to the next. In the piece, Simas’ mother, Laura Waterman Wittstock, reads excerpts of letters written by her own mother, who recounts both anecdotes and significant events of her life. But Simas demonstrates that written words and stories transmitted orally are not the only way to access information about one’s ancestors. Personal stories, especially traumatic ones, leave traces in the body of future generations. As Simas writes about her community, “recent scientific study verifies what many Native people have always known, that traumatic events in our ancestors lives are in our bodies, blood and bones. These events leave molecular scars adhering to our DNA. Our grandmother’s tragic childhood can trigger depression or anxiety in us, but we have the ability to heal these DNA encodings and change that trait for future generations.” With We Wait In The Darkness, which will be presented at ODC Theater from October 8 to October 10, Simas engages with her grandmother’s personal history to heal her family’s lineage through dance, as she explained during a phone interview. 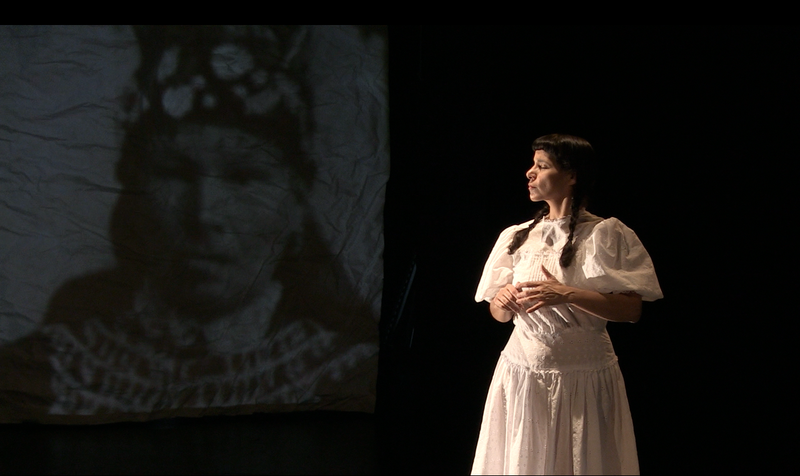 Marie Tollon: In a review of your work, Minneapolis-based arts writer Caroline Palmer mentioned that We Wait In The Darkness is the first piece in which you explore your Native heritage. Rosy Simas: It’s the first time that I do in an obvious way. I have always said that my work is Native because I am Native, regardless of the subject matter with which I am dealing. I have never made a dance that was specifically about my family or identity or culture because I’ve never felt a need to do that. This piece came about because I was doing research on my grandmother, basically unraveling oral family stories through genealogy and historical research around her. My grandfather came from a wealthier family than my grandmother, who was raised without parents. When my grandparents married, my grandmother’s family was looked down upon, and never talked about. So we have a lot of connections through my grandfather’s family but were completely disconnected from my grandmother’s family. What’s important about this is that Seneca identity comes from the matrilineal line of the family, so we get our clan and inheritance through our mother. My grandmother is really the source of my identity. It was very frustrating for me that we knew so little about her extended family. That’s why I decided to make this dance work, to give voice to her story and family – not to educate people about Seneca history and culture issues – although some sharing of our history and culture does come through as a secondary result because of the telling. MT: Your grandmother was one of the founders of the San Francisco American Indian Center on Valencia Street, in the Mission. Your mother is a journalist and author, and recently published We Are Still Here about the history of the American Indian Movement. How present was their form of activism when you grew up and how did it inform your work? RS: When my mother got divorced from my father, remarried and was transitioning from being a full time parent of 5 children to being a journalist, my grandmother was already in San Francisco helping run the San Francisco American Indian Center in the Mission. There were conversations between them and letters of encouragement from my grandmother to my mother, about working in “Indian Country” in education and journalism that my mother was interested in. We lived in Washington, D.C., when I was a child. Chiefs and faithkeepers from New York would come down to meet with government officials and would often stay with my family. So from a very young age, I was exposed to Native American political activity that was happening in the early 70s. We were in D.C. during the BIA [Bureau of Indian Affairs] takeover in 1971, which my mother was at. So from a very early age, I was an observer of Native American political resistance and activism. My mother’s main way of being an advocate is through her writing, and work in the Native community in education, journalism, and technology. She (like my grandmother) was also a founder and director of a Native nonprofit for over 20 years. Her position as an observer and reporter on political and cultural events – influenced my own activism, my political views and how I express them. My life has been very steeped in urban Native culture, so I never felt the desire to do any dance work about my identity or culture. I didn’t need to share what I was living with dance audiences , which were and are predominantly white. In various day jobs, I’ve worked in Native communities in health and wellness, technology, and culture. That’s where I did that work, with other Native people. My dance is not a catalyst for political actions, although that can be the secondary effect of them. I still feel that the issues that are important to Native people are important to me, but I don’t use dance to educate non-Native people about Native issues. I’m making work about subjects I am interested in exploring. My next piece is very much about intertribal, interracial identity through the lens of skin and how identity is shifting in Indian Country. I have my own concepts about how we view each other as Native people. I have a lot of internal questions and conflicts within myself about how I (and others) judge other Native people, and that’s why I want to engage in that subject matter. It isn’t to educate non-Native people about Native identity. The work is to engage in discussion and the physical manifestations that identity issues create. I want to unpack what I and other Native people are dealing with – the conflicts that come from families being split apart, missing Native women, social media discussions on identity, ethnic fraud, and dis-enrollment of people from their tribes. MT: In We Wait In The Darkness, your mother reads excerpts of letters from your grandmother. How did you discover those letters and choose the excerpts included in the piece? RS: The second letter that is read is a part of a much longer letter I just found in my mom’s things. I asked my mother to take pieces from that letter, which is 8 pages long, and put them together. I made suggestions of what I was interested in. For the piece, I asked her to write the other one from memory. After we put them together and recorded her – we decided it would be better if she could read them in the performances. My mother’s health was not good at the time, so we had to figure out if she would be able to do this. She doesn’t perform in all the shows or go to all the tour sites. She will be here in San Francisco at ODC. I didn’t plan for the work to have meaning for other people, that is just how it developed through the experience of performing it. Obviously my mother’s presence enhances the meaning it has for the audience. 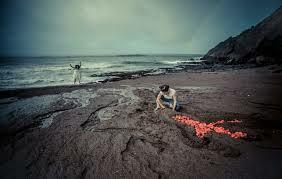 MT: Did the letters, or the film that is projected in the piece, help generate movements or did they exist separately? RS: The letters are really meant to have their own separate impact. It’s the stories that helped generate the movements. So for instance the story of my grandmother’s father being murdered in front of her and my research around that event, is something that generated specific movements. The film work is mostly film that I shot. We were shooting in New York, before we created the dance. I worked with a friend of mine, Douglas Beasley, who is an amazing award-winning photographer. He filmed the images of me that are superimposed on the images of the Kinzua dam, in Upstate New York. He did a lot of other footage as well but I ended up not using it. Because we have different eyes – different views through the lens- I ended up using all footage that I shot because it’s how I see things, it’s how I see the land. So there’s a direct relationship through my body, but I’m not necessarily responding to the film that much, even though the film is something like a partner for me on stage. I’m aware of what’s happening in the film while I’m dancing. The dance is an improvisation score. I’m interacting with the sound, which is generative music that François [Richomme] plays live during the performance. MT: You have been performing this piece for over a year. Has something unexpected surfaced? RS: All kinds of things can change the piece. I did a show in a museum and because of the sight-lines, they required me to wear a leotard in the first section, where I would normally be performing without a leotard. I was disappointed about it but it ended up being a very freeing performance in a different way because the texture of the fabric changed my movement. In each venue the environment is different. It’s been performed in two museums and everything from a large theater – at the Maui Arts and Cultural Center which seats thousands – to a small black box theater, at SUNY Fredonia, NY. Every environment shifts my relationship to the audience and it shifts how I move. The most interesting thing to me is the interactions with the audience and how that changes my performance. And where we are. When we work to get part of the local Native community members, to come to a show, even if it’s just a few people, it makes a huge difference for me, especially if there are any Haudenosaunee (Iroquois) people there because these experiences are very familiar to them and it’s a part of our large shared history. MT: Toward the end of the piece, you involve the audience by giving them a piece of a large map that you tear apart. I’m wondering what some of their reactions have been. RS: There are a lot of reactions to that. Of course it depends on who somebody is. It’s a relocation map. It’s two of the maps that were created by the US Corp of Engineers to relocate Senecas who the U.S. Government displaced by building the Kinzua Dam. It might be easier to tell the story of why I do that. My grandmother was an heir to Chief Cornplanter, who owned a significant amount of land in reserve. When that land was flooded by the building of the Kinzua Dam, she was then given a piece of land off Cornplanter to somehow replace her inheritance. She was at the time in San Francisco working at the American Indian Center so she appointed one of her cousins as administrator. He sold her land and took the money. So she never got her inheritance. The reason for me tearing up the map is because it has no use for my family and me because our inheritance was stolen from us – first by the government and then by the plague of greed the whole Kinzua Dam deal created among my people. I also want to shift the map, by tearing it and moving it around. The reactions of people that I’ve handed it to are completely different. If I’ve handed a piece to a Seneca, their response has more to do with their relationship to that whole specific event –and a lot of Native people have had these very similar things happened in their own community. The reaction of a non-Native person is all over the board, from feeling that they are being handed something for safekeeping to not wanting to be given a piece because they don’t want to have the responsibility of owning that part of history. It’s not a confrontational act on my end at all, it’s very matter of fact, but how somebody responds is how they relate to the history of this land and their own relationship to that shared history. After all, we all have ownership of the U.S. and Native treaties, they belong to all U.S. citizens. MT: In an earlier conversation, you mentioned that you are engaged in a process of decolonization when it comes to your training and practice. Could you talk more about it? RS: Contemporary dance is based in Eurocentric and American modern and ballet dance forms. Modern dance does have some roots in Indigenous dance. So there are some appropriated connections there. For me, it’s a lot about letting the pattern atrophy. It’s not that that training hasn’t been useful in my body but a more individualistic training like I do with Klein Technique or in somatics allows me to make my own cellular connections to create my own pathways which are Native because I am Native. This is my process of decolonizing my body. From a personal perspective of society, that’s much more complicated. Our bodies, the clothing we wear, so much of our American culture is related to colonization. We live on half-acre pieces of land. Everything is mapped out. How we are in the world is defined by this Eurocentric idea of land ownership. How we physically relate to each other is impacted by this. I like the term atrophy: In order to unlearn the colonized cultural and physical patterns in my body, I have had to allow parts of myself to atrophy (not weaken, but soften) in order to forget, grow and re-build back in a more organic and indigenous dancing body. EarthBodyHOME is inspired by the work of Ana Mendieta. Born in 1948, Mendieta was a Cuban American visual artist whose work encompasses photography, body art, sculpture and performance art, and whose tragic death in 1985 sparked a fierce debate about gender and race issues that still resonates within the art world to this day. Mendieta was one of the thousands of children who were sent to American orphanages and foster homes through the Operation Peter Pan, a collaboration between the United States government and the Catholic Church, in the early 1960s. 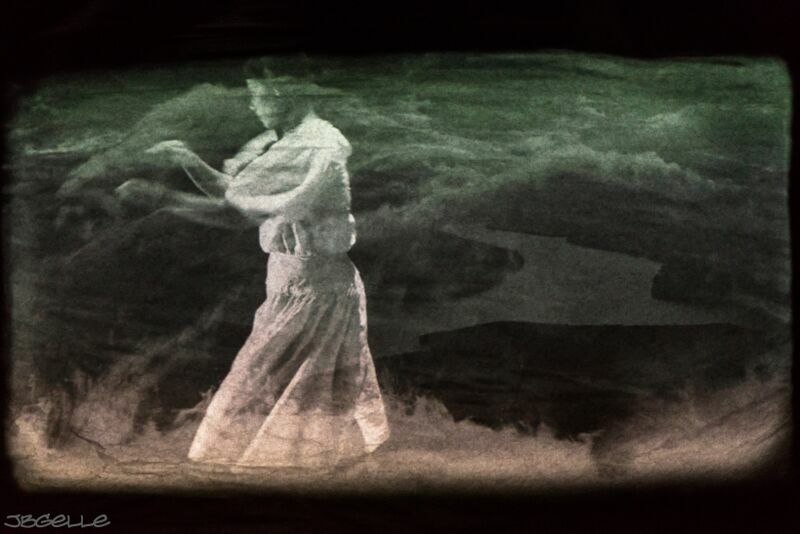 Exile and disconnection are some of the themes that permeate her work, some of which consists in ephemeral pieces created in nature, with elements such as soil, rocks, leaves, or blood and which she often referred to as “earth-body” art. Introduced to the work of Mendieta a few years ago, Tabor-Smith reconnected with it in the summer of 2014, while pursuing her MFA at Hollins University. Throughout her research for EarthBodyHOME, she imbued herself with Mendieta’s process to connect with the places that the Cuban-born artist explored. Tabor-Smith often rehearsed in natural settings, “opening [herself] to receive information and inspiration in a space.” As a priest in the Yoruba/Lukumi tradition known as Ifa, Tabor-Smith also researched the Afro-Cuban and Taíno mythology that Mendieta drew upon. Through pointing to Mendieta’s body of work and conjuring her spirit, EarthBodyHOME illuminates how an individual, personal and artistic trajectory reflects larger issues of identity, displacement, gender and racial inequities.